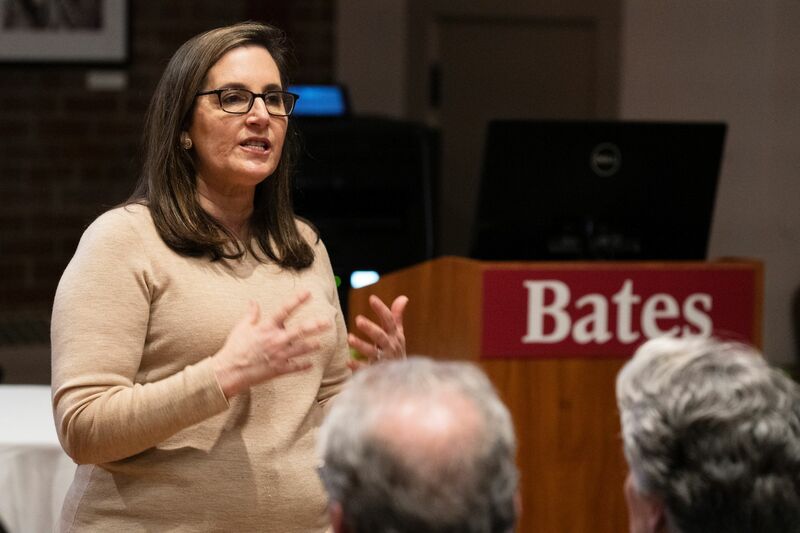 Whenever news emerges of special counsel Robert Mueller’s investigation into Russian influence on the 2016 elections, MSNBC and other outlets turn to Joyce White Vance ’82, an on-air contributor who helps guide viewers through thickets of revelations, rumors, and legal maneuverings. The thing is, a lot of news emerges about the investigation, which makes Vance one very busy law professor and former U.S. Attorney — and often makes for a very confused public. Inflaming emotions around the issue is the fact that the allegations involve the president of the United States. 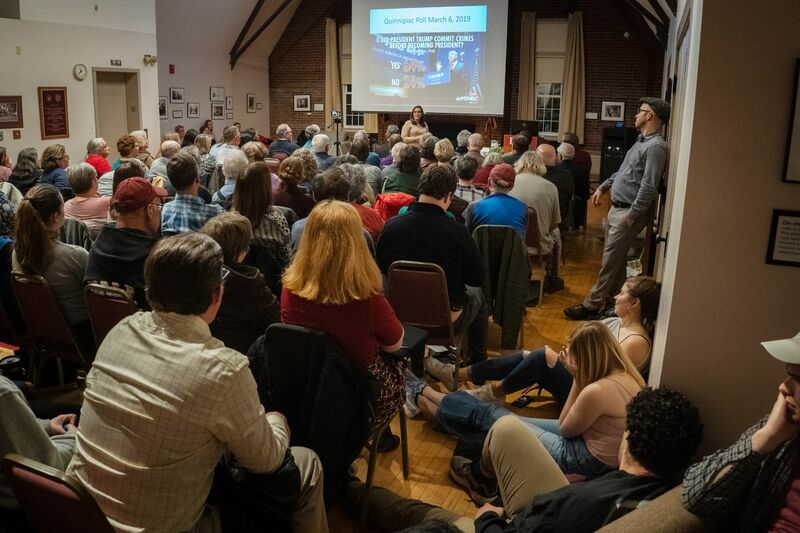 But it helps, Vance told a Bates audience Thursday night, to look at the investigation as a process: allegations were made, an investigation is taking place, and certain people are seeing consequences. It’s widely believed that Mueller will conclude his investigation at any time and make a report to the U.S. Attorney General William Barr — which means Vance was in particularly high demand this week. 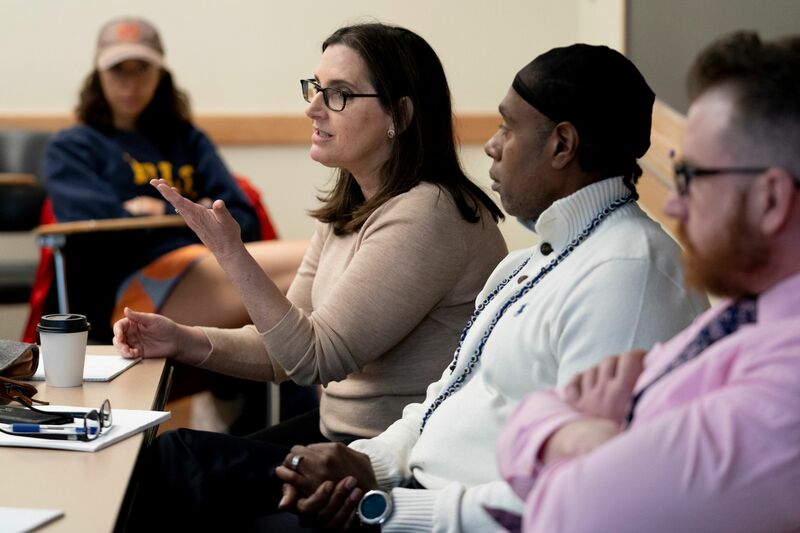 Still, she managed to squeeze in a visit to her alma mater, visiting a class to talk about her work on penal reform in Alabama and then giving a public talk to a packed Muskie Archives, part of the Harward Center’s Theory into Practice speaker series. Vance has decades of experience with and expertise in the rule of law. She was a federal prosecutor in Alabama for years before Barack Obama appointed her U.S. Attorney in the state’s northern district. In that office, she took on high-profile public corruption cases, fought the growing heroin epidemic, and prosecuted civil rights cases. In addition to her role as an MSNBC contributor, Vance is also a distinguished professor in law at the University of Alabama. The foundation of Vance’s legal career was laid at Bates, Vance said in an interview. Drawn to the college by an encounter with legendary debate director and rhetoric professor Robert Branham, she joined the debate team and majored in politics, writing an honors thesis under the direction of Garold Thumm, a professor emeritus of politics who died in 2012. 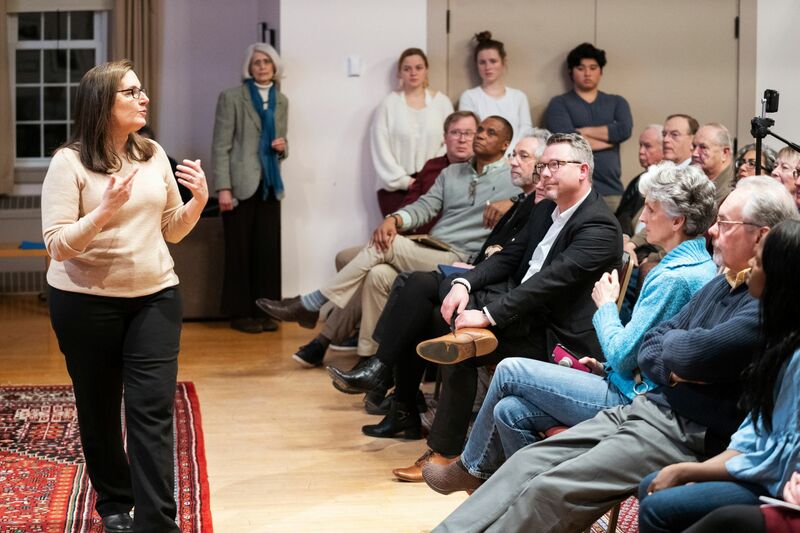 In her talk, Vance used Harvard law professor Cass Sunstein’s definition of the rule of law as a system of clear laws and fair processes: Citizens know why they might be punished, get advance notice of charges, and have ways to defend themselves in front of an unbiased tribunal. To Sunstein’s conditions, Vance added one of her own: that no man or woman is above the law and that the same laws apply to the president of the United States as to an ordinary citizen. That’s because, despite public denunciations of his work and changes in other key personnel, Mueller has stuck to his job, investigating Russian interference, other issues that arise, and perjury and obstruction of justice. He’s moved remarkably quickly since his 2017 appointment, Vance pointed out. By comparison, one of Vance’s public corruption cases, which resulted in the imprisonment of enough county commissioners to make a quorum, took more than six years. In just two years, Mueller has presented two unusually detailed indictments against Russian individuals and companies — one for waging an influence campaign on the public, one for hacking the Democratic National Committee’s servers. He’s also indicted six of Trump’s advisers (“You look at these folks, and you have to wonder what kind of vetting was going on” in their hiring, Vance said); five have been convicted of or pleaded guilty to a range of crimes. What Mueller hasn’t done is clearly establish that Russians and Americans — particularly the president himself — were working together to influence the election. It’s rumored that Mueller will soon make a report to the Justice Department, at the very least accounting for who he did and did not indict, and why. Vance doesn’t know what will be in that report, only that it seems early to submit it. It may be that Mueller is finished indicting people, but the investigation has turned up other crimes that jurisdictions like the Southern District of New York and the New York Attorney General’s office have taken up. Will the public get to see the report? Vance thinks so. A few things are working against a public release: Counterintelligence will stay classified, some indictments might be under seal, the DOJ typically doesn’t release information about people who weren’t indicted, and the president might even try to keep the report under wraps by invoking executive privilege — but the department recognizes that the public needs some kind of closure. “It’s possible Trump and his campaign did nothing wrong,” Vance said. “If that’s the truth, the country deserves to know that. It’s possible there was widespread criminal conduct and a full-blown conspiracy, and if so, we should know that. And what if the president doesn’t get indicted? That’s likely, Vance said. That could be because Trump didn’t commit a crime, or because Mueller doesn’t have enough evidence to make a convincing case that he did. Even if there was clear evidence, the DOJ has a stated policy not to indict sitting presidents. If criminal prosecution isn’t the right tool, impeachment could be on the table: Congress has the constitutional power to remove a president who has committed “high crimes or misdemeanors,” which are different from criminal offenses. It’s also possible that the president or those close to him did something wrong, but something that’s not grounds for prosecution or even impeachment — “awful but lawful,” Vance called it. In that case, if it offends the sensibilities of enough Americans, it’s up to the voters to remove the president in 2020. That’s why, Vance said, it’s important to stay engaged, to try to sift through the detail and rumor, and determine who will uphold the rule of law and who will threaten it.